Aortic Pulse Wave Velocity (PWV) is a surrogate marker for arterial wall compliance and is defined as the propagation speed of the systolic blood pressure wave through the aorta. PWV is a powerful predictor of all-cause and cardiovascular mortality in various patient groups. PWV can be acquired invasively during catheterization. Although accurate, this method is not well suited for screening or follow-up. Validation of PWV acquired non-invasively with Velocity-Encoded (VE) MRI by comparison to invasive pressure measurements during catheterization. Also, reproducibility of PWV assessment with MRI is tested. MRI was performed on a 1.5 T Gyroscan ACS/NT15 (Philips, Best, The Netherlands). Through-plane VE MRI using free breathing was determined at three locations: 1. ascending aorta proximal to the aortic arch (AA); 2. start of the descending aorta (DA) just distal to AA; 3. DA proximal to abdominal bifurcation. Measurements at site 1 and 2 were acquired during the same acquisition, with the acquisition plane positioned just below AA (Figure 1). Scan parameters: FOV 300 mm, acquisition voxel size 2.3 × 2.3 × 8.0 mm3, through-plane velocity encoding with velocity sensitivity 200 cm/s, maximal number of phases reconstructed during one average cardiac cycle resulted in a temporal resolution of 6–10 ms. Acquisition at site 3 was performed with the same technique, except for using the body coil for signal reception instead of the 5-element cardiac coil and a velocity sensitivity of 150 cm/s. Data from VE MRI were presented by aortic flow graphs. The arrival time of the systolic flow wave at a particular site was determined from the foot of the wave. The distance between the measurement sites was measured along the centerline of the aorta. PWV of the AA (PWVAA) was determined from the distance between site 1 and 2, and the difference in arrival time of the particular waves. PWV of the DA (PWVDA) was similarly determined between site 2 and 3. In 18 patients selected for diagnostic catheterization, pressure measurements were acquired during pullback using a 6 F pressure tip catheter (Cordis Corporation, Miami Lakes, FL, USA). Pressure waves were recorded in the ascending aorta, DA just after AA and in DA proximal to the abdominal bifurcation. The distance between these sites was determined from the catheter pullback. The arrival time of the systolic pressure waves was determined from the minimal blood pressure, just before the rise in pressure. Eight healthy volunteers were selected to test the reproducibility of PWV assessment with MRI. Subjects were scanned twice on the same day, and once one week later. PWVAA and PWVDA were determined on all occasions and compared for reproducibility. 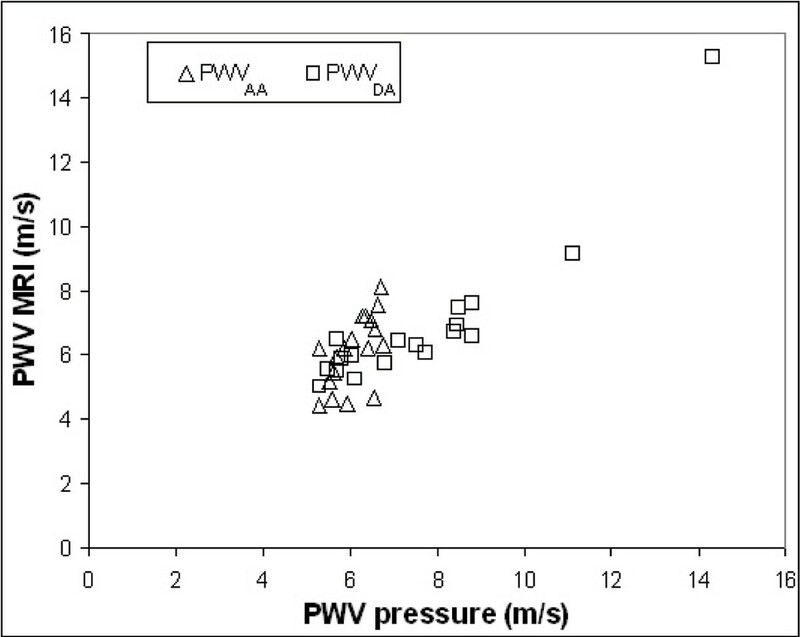 In Figure 2, the results for comparison between PWV assessed with MRI and pressure measurements are presented. PWVAA and PWVDA showed good agreement between MRI and pressure measurements (correlation r = 0.62 for PWVAA; r = 0.92 for PWVDA) with no statistically significant bias (difference between MRI and pressure was 0.7 m/s for PWVAA and 1.0 m/s for PWVDA). Coefficient of variation was 8% for PWVAA and 9% for PWVDA. Aortic Pulse Wave Velocity assessed with MRI is validated by invasive pressure measurements during catheterization. Reproducibility of the MRI method is tested and compared to physiological variation. Reproducibility for PWV acquired with MRI on the same day was high: r = 0.93 for PWVAA; r = 0.53 for PWVDA with no statistically significant bias (difference 0.2 m/s for PWVAA; 0.2 m/s for PWVDA). Coefficient of variation was 11% for PWVAA and 14% for PWVDA. Physiological variation in PWV was higher: r = 0.57 for PWVAA; r = 0.51 for PWVDA with no significant bias (difference 0.1 m/s for PWVAA; 0.1 m/s for PWVDA) and coefficient of variation 20% for PWVAA and 18% for PWVDA. Non-invasive acquisition of aortic PWV with VE MRI shows good agreement with invasive pressure measurements and can be determined accurately and reproducibly within the limits of the physiological variations.